The Book Chook: Let’s Celebrate The Reading Hour, 2014! Let’s Celebrate The Reading Hour, 2014! Next week there’s a special day that’s a great way to add a little more literacy and literature into your kids’ lives. 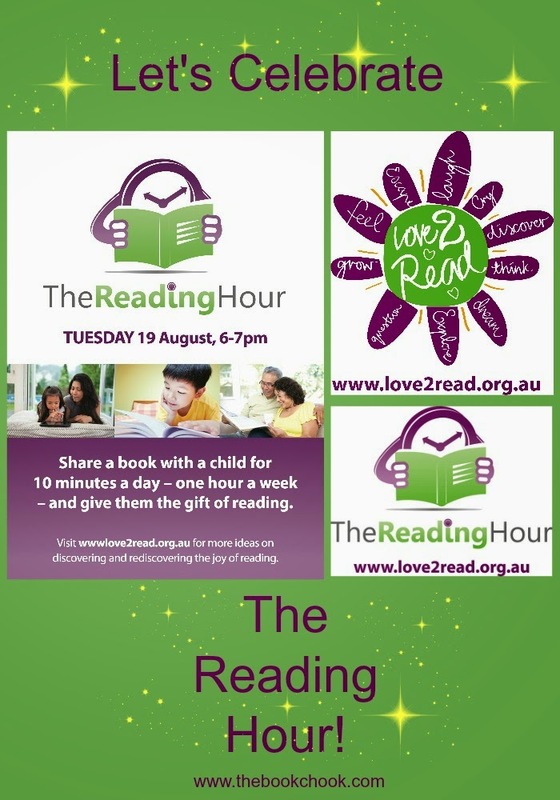 It’s The Reading Hour, officially held between 6.00pm and 7.00pm on Tuesday, August 19. But let’s face it, The Reading Hour can be celebrated anytime, and multiple times! The Reading Hour continues to inspire Australians working toward the shared goal of helping to lift literacy rates and the country becoming a nation of readers. Reading doesn’t have to be a massive undertaking in our busy lives. Sharing a book with your family for just 10 minutes a day - will give children the best chance of becoming good readers, along with all the social and educational benefits literacy brings. Why not use The Reading Hour as a focus to celebrate reading and what it means to you and your family? Throw a Reading Hour slumber party and read by candle or torchlight. Invite friends and friends’ children. Have book-related food (no, not paper sandwiches, food that reminds you of loved books!) Take a moment to give each other book recommendations, or share pre-loved books. Watch a movie later that has a book tie-in. If you’re in a school, what’s one more initiative you could take that has the potential to raise the profile of reading for enjoyment? Perhaps you could encourage kids to tell others about their favourite reads via post-it notes on bookshelves, or go high-tech and have them make 30 second trailers on PhotoPeach or via video software. Wouldn’t it be fun to have a bookish cupcake decorating competition? Then a party where kids talk about the cupcake, and the book that inspired it. Followed by shared readings and cupcake consumption of course! There are handy posters and images available to download that you can use to publicise The Reading Hour in your community. You can see some of them in the image above. AND grab a countdown widget for your blog, like the one in my right sidebar, so you can’t forget. The Reading Hour makes a fine celebratory start to what can go on to become a daily habit. Kudos to those who share stories with kids every day of the week! What will YOU do to celebrate The Reading Hour in 2014?